Golf Cart Parade, Palm Desert, California: In this self-appointed golf capital of the world, the carts make perfect floats - and may arrive at this October spectacle decked out like a Cadillac Escalade or Bob Hope. 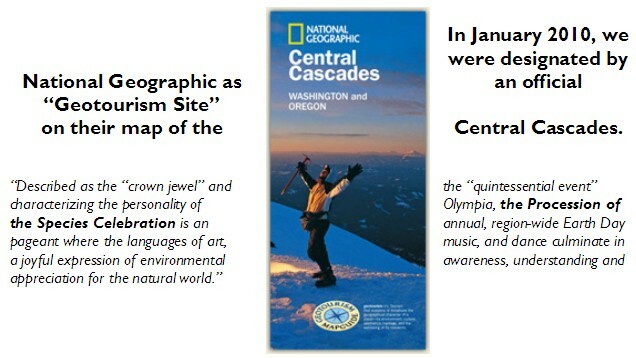 John Francis sees National Geographic's new geotourism map of the Central Cascades as an opportunity to tell the rest of the world all the region has to offer. 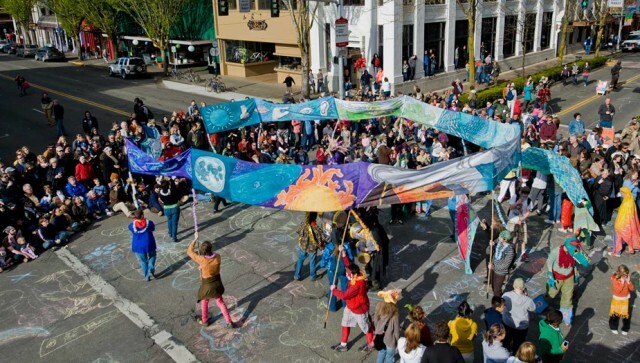 Eli Sterling, who heads the group that produces Olympia's Procession of the Species Celebration, sees the event's inclusion on the map as an affirmation of its mission. Bob Grubb, who owns Wapiti Woolies in Greenwater, hopes the map will remind people of the wonder of a journey to Mount Rainier begins long before you reach a park's entrance sign. While offering differing perspectives, the three agree the map will be nothing but a benefit. The magazine's Center for Sustainable Destinations released the map Jan. 19, the eighth in a series that includes the Yellowstone area, Guatemala and the Sonora Desert. The Cascades map features 200 locations and events, including 19 in Pierce and Thurston counties. The map highlights natural wonders, trails, art, places to dine and spend a night or buy a souvenir � places that reflect the cultural and natural heritage of the region. It covers the area roughly bound by Mount Rainier to the north, Crater Lake to the south, Interstate 5 to the west and U.S. 97 to the east. "This is a remarkable region," Francis said. "I enjoyed the outdoor spirit, sensibilities and aesthetic appreciation of day-to-day life here." Francis' view is shaped by his upbringing in south Seattle and his current job as vice president for research, conservation, and exploration with National Geographic. Each summer of his youth, his family would gather at a U.S. Forest Service campground along the Ohanapecosh River. He skied at Crystal Mountain and the Summit at Snoqualmie. "That love of the land is something you carry with you all your life," he said. That's why Francis supported the Cascade project from the first conversations in 2003. "People are so urbanized, they have kind of forgotten nature. But we are a part of nature. You have to carefully consider your role in maintaining and enhancing the planet," he said. Which is the core value of geotourism, Francis said. The magazine's Center for Sustainable Destinations, which is producing the maps, defines geotourism as "tourism that sustains or enhances the geographical character of a place � its environment, heritage and the well-being of its residents." Looking to define the Central Cascades, staffers chose places and events, be it the bike ride around Mount Rainier or Wolf Haven, that advance the authenticity of the region. "How often do people think 'What am I going to do this weekend?' (The map) is exactly what people are looking for. They're looking for a unique experience." Being part of the Central Cascades map recognizes the event for what it is, said Sterling, director of Earthbound Productions, the company that produces the event. 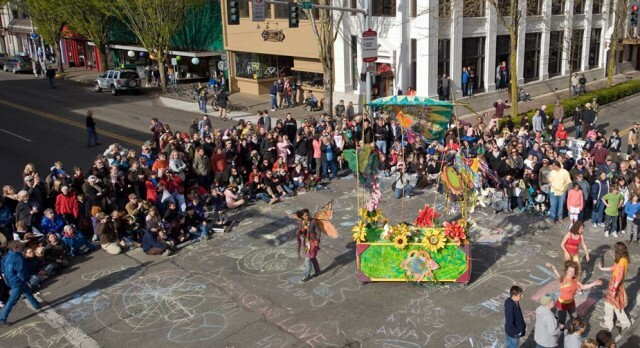 That recognition, he said, should relieve any pressure on organizers to make changes in hopes of attracting more visitors. They will come for what it is, he said. "When you're included in (the map), it helps stabilize us in our own community," Sterling said. 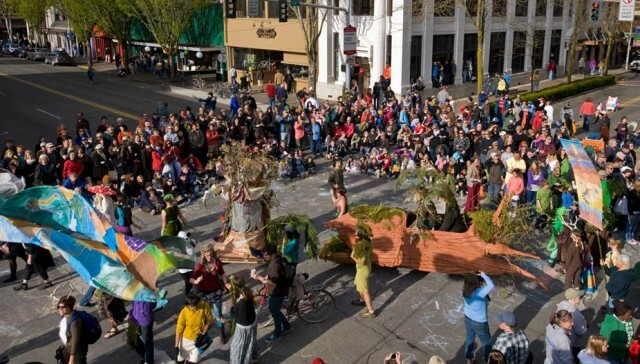 The procession celebrates Earth Day through the arts, recognizing people's relationships with each other and the natural world. 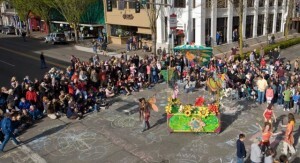 This year's event � the 16th procession � is scheduled for April 24. "Geotourism allows you to move into a community where they have defined their quality of life. It puts us in a place where people can share what we have created. It invites people to come witness what we have created," Sterling said. 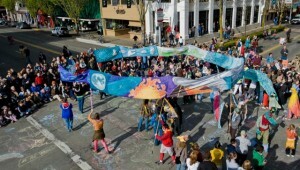 The concept of geotourism, Sterling added, blends well with the procession's mission. "People are far more willing to protect that which they create than what they consume," he said. Grubb and his wife, Debbie, opened their wool hat business 35 years ago. While a tourism promoter from the beginning, it is now a bigger part of the business than ever before, he said. "We do a lot to help folks enjoy their stay here. Whether that's provide a service or information. We help with that journey," he said. When a tour bus pulls off Highway 410, the staff is ready with information on traveling the area, tips on things to do and directions to the restroom. "We provide them info on what they can do to enjoy themselves. We also try to sell stuff, but we leave that decision up to them," Grubb said. The concept of geotourism is one Grubb said he embraced long before the term was coined. "It promotes tourism that promotes our natural resources, our parks, our ski areas, all the places that are important to us," he said. "What people don't understand, a trip is an experience, but when does it start? It starts when you leave your home, your hotel. It starts with the drive, it doesn't start when you enter the park. There is a lot to the whole experience." Having National Geographic be the driving force behind the map won't hurt either. Grubb said he noticed a buzz when the map was unveiled. "They're someone special. Just them doing it gives it a good start," he said. Barry Maas said the map will appeal to more than out-of-state visitors. When he was invited to submit photos for the map, Maas hit the road. He and his wife, Rachel, took a four-day trip through the Washington area covered in the map. His image of people watching salmon move through the Bonneville Dam fish ladder was included on the map. "There were so many places we have never been before," the Bothell photographer said of their trip. "That's what makes this map so great." And some places have made a lasting impression. He and his wife spent New Year's Eve at Alexander's Country Inn just outside Mount Rainier National Park. He also discovered a new favorite drive. "We did (Highway 410) from Yakima to Mount Rainier. I think that's the most beautiful drive in Washington," he said. The map also should help better define the Central Cascades as a destination, said Mary Kay Nelson, executive director of Visit Rainier. "It's a trip itself. People need to see the Central Cascades as a place. There is so much more to do than a day trip," she said. "They have taken all the best places and written about them. You can be sure these places are real and you'll have a good time there," she added. Working on the map has reinforced Nelson's desire to explore her own community more. She cited the Recycled Spirits of Iron, outside of Ashford, as an example. "I've done it myself, driving by going up and back from the mountain, and not stop. Now, I'm taking the time to stop at places like that," she said. First, let me congratulate you on an extraordinary event. What you've created over the last 15 years is really quite remarkable. It's truly invigorating in every sense - bringing out the gifts in individuals and community - and, whether they choose to formally recognize it or not, your gift to the region and the planet as well. 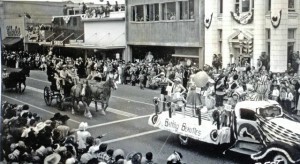 I climbed on Bartel's roof and took a few photos of the Procession, attempting the repeat of the 1950 photo. I shot wider angle and a bit higher than the old photo, but I think we'll find something suitable to blow up and add to the show this Fall. Best of luck and heartfelt good wishes for an event that must surely continue and flourish.